There came a week of the sublime. 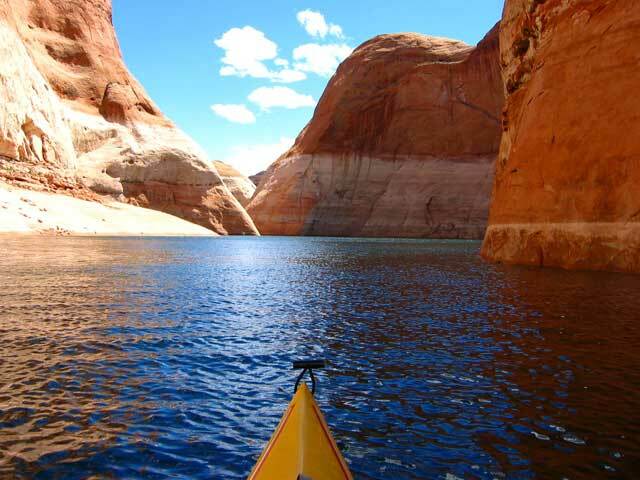 The main body of water – Lake Powell – has 96 slot canyons to explore, all the result of the Glen Canyon Dam built in the early 60s. 700 feet down is/was the original Colorado river. An ecological abomination to many, but strangely, artificially beautiful. I sit on smooth sandstone from 6 to 10 in the morning every day and gaze out. I read. I practice the small guitar I have with me. I eat. Then I get climb in the kayak and leave for some exploring.